Coming to you from Africa's wild Okavango Delta, this cuddly croc's toothy grin is sure to warm your heart. 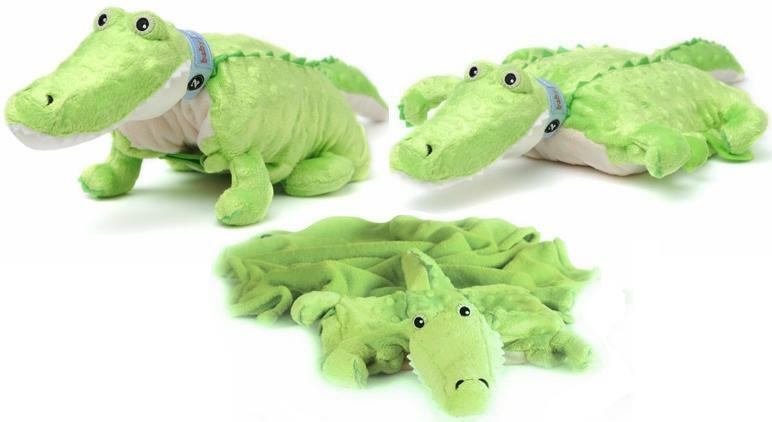 Kojo will no doubt become your child's constant companion as not only is he an adorable crocodile, but also a comfy pillow and super-soft blanket all in one. Perfect for road excursions or just cuddling in bed. Kojo also makes the perfect baby shower gift. Super-soft coral fleece blanket with satin Comfort Corner: 29"x23"
Washing-Blanket: Machine wash, tumble dry. Outer pouch: spot wash (if machine washed, using a lingerie bag is recommended). Blanket zips off/on for easy washing. Two bottom hook-and-loop Velcro tabs gather Zoobie into animal shape. Recommended for infants and toddlers; safely tested for all ages. Available in inventory at $21.95 each.